Artwork details: coloured pencil over paper stained with gouache, 27 x 16.5 inches (69 x 42 cm), 2003. Scroll down: This is such a big, detailed picture it doesn't really show up well on a monitor - but in an attempt to show this one in a flattering light I have taken a slice through it showing most of the characters' faces. I reckon it took me about 80 or 90 hours to draw and paint. There's a kind of chess thing going on here, which of course is a sort of formalized war-game, but look closely and you'll see a few battles of a more romantic nature, too. The Red King has his eye on the White Queen (to which end he appears also to be colluding with the white bishop), the White queen meanwhile has something going on with one of her knights, who in his turn has taken his eye completely off the ball and is in no position to help his comrade against the Red Knight about to attack them both. 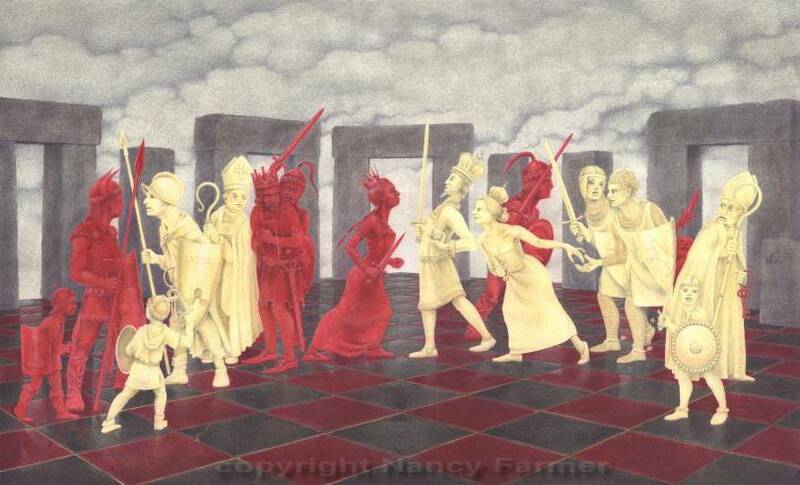 And the second White Bishop (on the right), casting a dissapointed backward glance at the White Queen, is rapidly deserting the field with a bunch of Red keys in his hand. The Phrase "all's fair in love and war" gave the piece its title. Actually I love this sort of complex balancing of characters, but each time I think I could have done more with a picture, and I'd love to do this picture again sometime with more complexity.